I love acorns. I have an acorn doorknocker on my front door. I have a framed photo of acorns on my living room wall. Nine years ago my wedding favors where acorn shaped chocolates that my husband and I spent days making. And we have just moved into "duck and cover" mode in our yard as the acorns have just started pouring out of the oak trees. 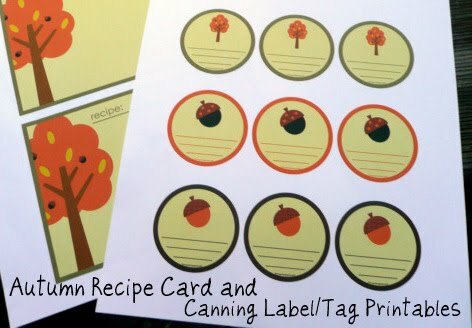 With acorns on the brain, I decided to make an autumn acorn printable to share with you. I created two printables for you to download. The graphics are all original, created by me. The first is a set of two autumn-themed recipe cards. Click HERE to download the recipe card PDF. The second is a set of nine autumn-themed canning labels or tags. Click HERE to download the label/tag PDF. 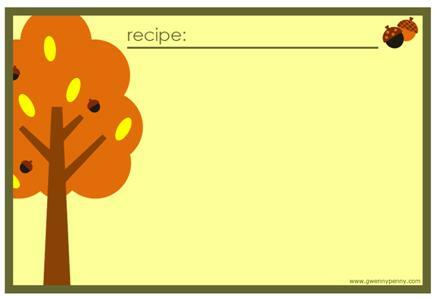 Recipe cards: This printable contains two blank recipe cards. Print on white letter size cardstock at 100% (no scaling). Cut out each card. Finished recipe cards are 4 x 6 inches (10 x 15 cm). Canning Labels/Tags: This printable contains nine round canning labels or tags. If making labels, print on label paper at 100% (no scaling). If making tags, print on white letter size cardstock at 100% (no scaling). Cut out each label/tag using scissors or a 2 inch paper punch. Finished labels/tags are 2 inches (5 cm) in diameter. To create tags, use a hole punch and add ribbon, string, or twine. All printables are for personal use only. You could even use the labels/tags to leave a little note for someone (maybe in a lunch bag). This is the first time I've tried to share a file, so if you have any trouble downloading these printables please let me know. Hope you enjoy! I'm obsessed with acorns too! OUr deck is dangerous right now for bare feet, all those little pointy acorns all over it. I still love them! I will be posting about a cute acorn thrift store find soon. Happy Friday! So cool! thanks! I will print these out today! I love acorns too...just need a yard and some trees lol! Thanks so much for these fun printables! I just love fall...so these are wonderful! I love 'em! 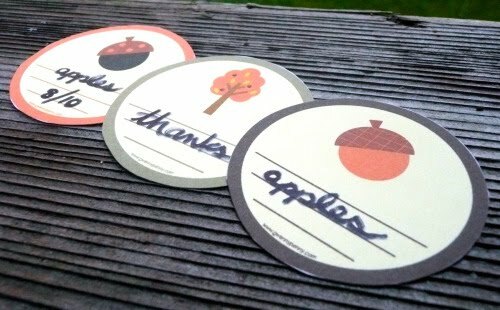 I was feeling wishy washy about canning apples this year - but you've convinced me that I must so I can use these cute labels! Thanks for sharing. Wow - these are adorable! I'm canning tomorrow so these will be perfect! Love these! I'm definitely printing a few. What a sweet idea. I will print these tomorrow. Stop by my blog sometime, I'd love to have you. So cute and clever and perfect for fall. Thanks! LOVE your header, the colors really grabbed me. We are in duck and cover mode too! We have a porch with a tin roof over part of the 'fall zone'. It's like gun shots all day! Hi Gwen-- Love these! Adorable! these are adorable! thank you for doing such a wonderful thing that you are sharing with all of us! I love these - thank you for sharing! Thanks--these are way too cute. These are adorable, I could swear I left a comment about them before! The acorn is my favorite, thanks for making those super sweet tags, those would be great for little scrapbook page embellishments, and I think I'll be using them for exactly that! Thanks also for joining us at A Crafty Soiree. so nice picture.The theme of your blog is very beautiful and the article is written very well, I will continue to focus on your article.Please keep sharing more and more information about it. i really like tags like yours for scapbooking and all kinds of things. thank you for sharing.